The Margarita De Necochea Bulldog Aquatic Center, completed in July 2016, replaced the original pool damaged by a 7.2 earthquake that struck the region back in April 2010. The $7.4 million project consisted of $2.7 million in state funding from a California Parks and Recreation Department grant, Calexico’s Measure H Revenue, Calexico’s Measure H bond and the Federal Emergency Management Agency. The pool layout was designed in two sections: one for small children and the other for older, more experienced patrons. 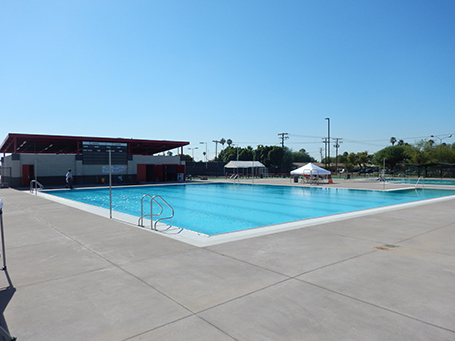 The new facility will serve as a hub for the Calexico Swim Team, local-residents and its surrounding communities; and be a place where residents of all ages can enjoy a safe swim and play with family and friends.